Understanding the effects of CBD is confusing when THC is sometimes mentioned too. Do they come from the same plant? Do they both make you ‘high’? And how are they different exactly? To help you, we’ve put together this informative guide to explain the differences between CBD and THC. CBD stands for cannabidiol. It’s a cannabinoid - a natural compound - that’s found in cannabis plants (also known as cannabis sativa). It is not considered a controlled substance and is 100% non-psychoactive, which means it doesn’t make you feel “high”. THC stands for tetrahydrocannabinol and is also a cannabinoid found in cannabis plants (there are over 100 different cannabinoids in total). THC is the compound that’s responsible for causing the marijuana ‘high’. Because it’s considered a controlled substance, it is often deemed illegal. Does CBD have THC in it? CBD does not have any THC in it as they are two different compounds. However, it’s important to know that CBD hemp products often have a very small percentage (0.3%) of THC, due to both compounds being in the cannabis plant when the CBD product is made - be it tinctures, oils, edibles, etc. How is CBD different to THC? 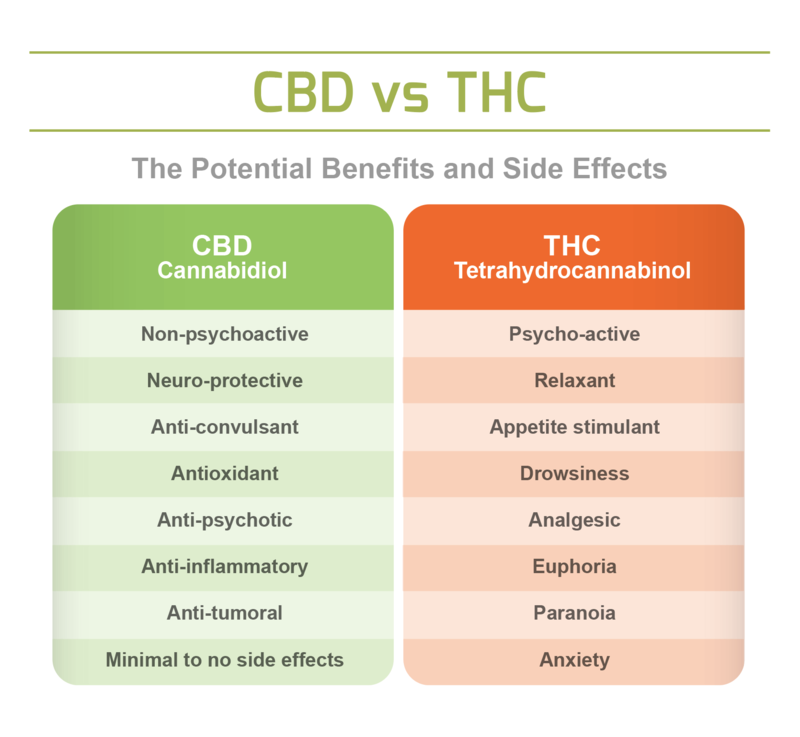 The main difference between CBD and THC is the effects they have on you. Put simply, THC gets you ‘high’ while CBD won’t. This is because CBD does not bind effectively to our endocannabinoid system - the body’s unique system that regulates elements such as sleep, appetite and our immune system. It’s this binding action that gives you that ‘high’ feeling. THC initiates a psychological response via the endocannabinoid system’s cannabinoid 1 receptors (CBD1), found primarily in the central nervous system and the brain. When the CB1 receptor is activated, it produces a psychoactive effect. CBD doesn’t bind with the CB1 receptors and so has no effect on your perception or sensorial experiences. In fact, research has suggested that when CBD is taken with THC, it can lessen the psychotropic effects of THC by suppressing the CB1-activating qualities and so protecting the consumer from getting too high. Without getting too scientific, CBD and THC may share the same chemical composition, but their atomic arrangements are different. Both of them are considered cyclic compounds, which means one or more of the atoms in the compounds connect to form a ring. CBD has an open ring, while THC has a closed ring. Why does this matter? It’s this arrangement that means they interact differently with the endocannabinoid system’s receptors. While THC and CBD are both found in cannabis plants, THC is most plentiful in other forms of cannabis while CBD is found in higher quantities in hemp. When other types of cannabis are grown, the THC content tends to be maximized to produce more powerful intoxicating effects. Hemp, on the other hand, is dominated by CBD. In order for a cannabis plant to be classified as ‘hemp’, its THC content is to be no more than 0.3%. Here at Endoca, we’re avid believers in the wonderful benefits of CBD oil. And medical studies have suggested that CBD can help with social anxiety and panic attacks. THC, on the other hand, can in fact worsen anxiety and increase paranoia in some people, as suggested by other medical studies. However, some studies have suggested that when THC is combined with CBD, the negative effects are lessened. Other forms of cannabis and cannabis-derived CBD will get you ‘high’ because of their large amounts of THC (around 30%). This means that they’re often illegal in many countries around the world. However, when CBD is derived from the hemp plant, it has such minute levels of THC that many countries have no laws against its use. Click here to see if CBD is legal in your country. In conclusion: how are CBD and THC the same? And how are CBD and THC different? Hemp-derived CBD is legal in most countries, THC is not. What are the different CBD and THC products available? This will provide that euphoric, ‘high’ feeling. This will be a little more euphoric than CBD-strong strains, but it is less likely to induce THC’s negative side effects in the consumer, such as paranoia and anxiety. This will not get you high and can in fact provide some wonderful benefits. Here at Endoca, all our products are CBD dominant. If you’re curious about CBD products, then head over to our CBD online shop. If you need a helping hand making an informed decision, you can also send us a message via our chatbot or drop us an email — our support team will be happy to help.